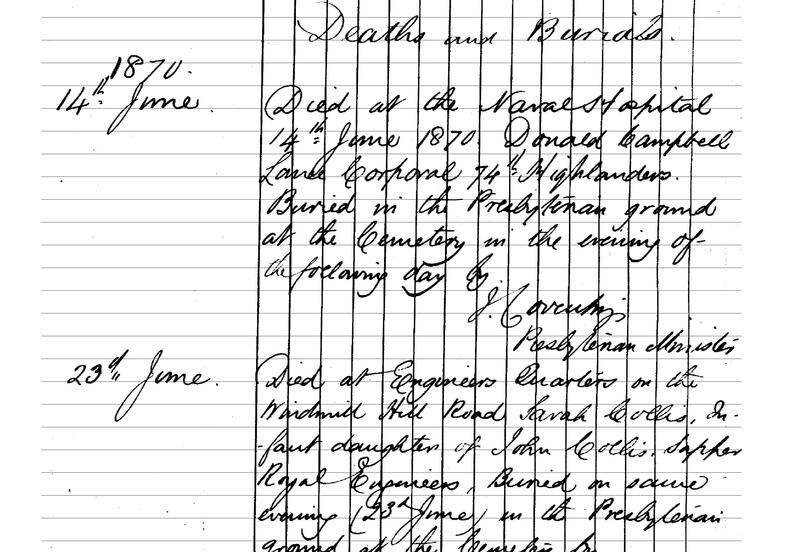 These burial records are from the Presbyterian St Andrew’s Church of Scotland in Gibraltar from 1852 to 1969. The records date back to a couple of years before the building of the church. There is a long history of Presbyterianism in Gibraltar which is closely linked to the many Scottish regiments which served in the colony. Gibraltar is located on the Iberian Peninsula and its commanding position has made it an important naval base in British history. The history and work of the Church of Scotland in Gibraltar is closely linked with Scottish Infantry Regiments who have been stationed on the Rock during the last 230 years. These men and their families have always been foremost in giving of their best for the benefit of the Church. The records are incomplete on the names of early Ministers, but it is known that Presbyterian chaplains were usually attached to Scottish Regiments during their tour in Gibraltar and also ministered to the civilian congregation long before the Church was built. It is of interest to note that the badge of the Highland Light Infantry is the Castle and Key, superscribed `Gibraltar 1780-1783'. This distinction was awarded for the gallant part played by the Regiment during the last Siege of Gibraltar. The Presbyterian Chaplain during these years was the Rev. Aeneas MacLeod. While mist enfolds the mountains. To the lads of the Marquis of Huntly. The names of the men of the 4th Battalion, The Black Watch (Royal Highland Regiment) who died at Gibraltar during 1940-1943, are recorded on a brass plate on the North wall.